Many of you are no doubt preparing for compliance with the European General Data Protection Regulation (GDPR) requirements, which have a fast-approaching enforcement date of May 25. A significant component of the regulation will require companies to retain personal data on European residents no longer than is necessary to satisfy the purposes for which it was processed. If your organization does collect and process any personal data, have you justified its retention through your records retention schedule or privacy policies? Companies need an up-to-date records retention policy and schedule to support both deletion and retention of critical information. Join Tom Mighell, Esq., as he discusses the top 5 reasons an outdated retention schedule can undermine your GDPR compliance. In many ways, creating your GDPR Data Protection Policy is the easy part. As the May deadline approaches, the real work begins on finding all your Privacy Data not only in databases but also GDPR content scattered across file shares, desktops and other storage repositories around the world. In many ways, having your Data Protection Policy in place is not necessarily the last mile, but the first. In order to be fully GDPR-compliant, you need to understand where all of your information is, where your privacy data lives and how it’s being secured. 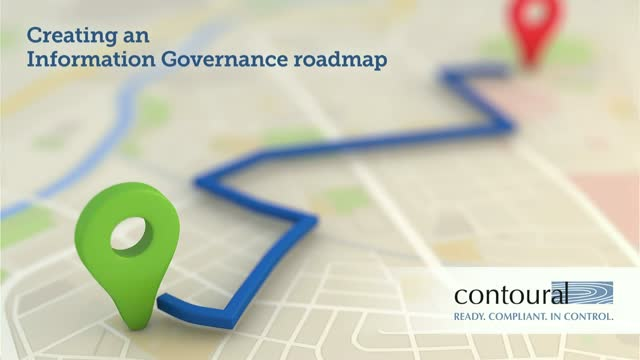 Join Tom Mighell, VP of Delivery Services at Contoural as he discusses the roadmap you need to follow to achieve full compliance before the May 25th deadline. Like most companies, you probably have a process for responding to discovery requests in litigation or regulatory matters. But is that process documented? If the staff in charge of discovery left today, or if that big class action finally hit, would you be prepared? Sometimes, having a consistent, repeatable process in place can help to protect you from surprise, sanction, or high discovery costs - especially if your company has a low litigation profile. We don’t usually think of records retention schedules as exciting, but they happen to be one of the most important pieces of your e-discovery and information governance foundations. Many organizations consider records retention as something that they have to do, but feel handcuffed because they have no way of enforcing a policy. Often the biggest challenge of launching an Information Governance (IG) program is securing funding. Information Governance professionals understand the value IG programs bring to an organization, but the challenge is effectively communicating that value to senior management. How can you move your program's funding from "should do"
Mark Diamond is founder and CEO of Contoural and one of the industry thought leaders in proactive records & information management, litigation readiness and risk & compliance strategies. As a trusted advisor he and his company help bridge legal, compliance, security and business needs and policies with effective processes, technology and change management. Mark is a frequent industry speaker, presenting at numerous Legal and IT industry conferences as well as online venues. Additionally, Mark addresses more than one hundred internal corporate audiences each year. Business units want a policy that allows them to save everything. Legal wants the minimum saved. IT just wants something easy to execute. What should we do? A committee is formed, with legal, IT, records management, HR, and others. The committee meets. Discussions ensue: Which are business records? How long should we save them? Do we allow exceptions? The committee meets again. And again. We’re stuck. Join Ed Rawson , Michelle Hanrahan, Shawn Cheadle and Mark Diamond as they discuss strategies for building consensus across your organization and making sure your initiative doesn't get stuck! Ed Rawson is a strategic, results-oriented thought leader who has dedicated over 30 years of his career to helping organizations manage their paper and digital content lowering cost and increasing productivity. Ed has helped organizations to align information with business value and operational direction to maximize the return on investments, lowering risk and maintaining compliance. Michele Hanranhan is Records Manager at Sound Transit since January 2015 and is leading a RIM group to implement ECM solution organization wide. She previously worked at Federal Home Loan Bank of Seattle, PATH, and Washington State Department of Transportation and has over 16 years of experience in Records and Information (RIM) with a variety of business, government and non-profit organizations. Shawn Cheadle is General Counsel to the Military Space line of business at Lockheed Martin Space Systems. He supports government and international contracts negotiations, drafting and dispute resolution. He also supports information governance, eDiscovery, records management, counterfeit parts investigations, and other functional organizations at Lockheed Martin. He is an ACC Global Board Member, current Information Governance Committee Chair and former Law Department Management Chair, and former Board member and President of ACC Colorado. Sometimes there is a mandate to delete large quantities of emails and files very quickly, either after litigation or simply because senior management gets fed up with too much electronic junk. When needing to delete a lot quickly, traditional “manage and let expire over time” approaches don’t work. On the other hand, blanket, delete-everything approaches can run afoul of record retention and legal requirements. What’s an organization to do? Dan Elam is one of the nation’s best known consultants for information governance. As an early industry pioneer, he created the first needs analysis methodology and early cost justification models. Dan’s involvement has been in the design and procurement of some of the largest systems in the world. Today Dan helps Contoural clients develop business cases and establish strategic road maps for information governance. He is the former US Technical Expert to ISO and an AIIM Fellow. Taking a “save everything forever” approach and employee hoarding of e-mails, files and other types of electronic documents are burying organizations under mountains of data, exposing them to privacy risks, increasing costs and risks of eDiscovery, as well as sapping productivity from employees who spend hours every week looking for information. Yet many company’s efforts at aggressively deleting electronic documents are either ineffective or worse, they have the unintended effect of driving “underground archiving” whereby employees save information in insecure locations. Join us as we explore smart approaches to preventing employees from hoarding documents. Kathryn Hilton, Vice President of Consulting for Contoural, has more than 20 years experience in records and information management, strategy consulting, and data storage technology. As a Contoural consultant and practice manager, Kathryn has developed methodologies for Records and Information Management organization design and for Change Management strategy, process, and content. In addition to leading Contoural teams in these areas, Kathryn assists clients with the globalization of their programs, and has visited client sites around the world for a detailed understanding of business and legal information management requirements. Jo Kathryn Goldstein, CRM is currently Senior Manager, Information Governance for Whirlpool. Her career in Information Management has included the pharmaceutical and banking industry. In the past Jo has served as Vice-Chair for PRIMO- the Pharmaceutical Records and Information Management Organization, President of the Indianapolis ARMA Chapter, and the former ARMA Standards Development Committee. Patricia Oliveira leads the Records & Information Management program for MUFG Americas, part of a global financial institution. As such, her focus is to support and develop an enterprise-wide, compliance based RIM program focused on risk mitigation. She has over two decades of experience in planning, designing, and executing complex integrated programs, building strategic organizations, and leading change in multiple disciplines and diverse industries. Mark Diamond is founder & CEO of Contoural. He is an industry thought leader in proactive records & information management, litigation readiness and risk & compliance strategies. As a trusted adviser he and his company help bridge legal, compliance, security and business needs and policies with effective processes, technology and change management. - Where is the right place for specific content to live? - How and where do we keep as few copies as possible? Who can and should have access to what? - How do we make it easy to apply both retention and data security, while still enabling classification. Join us for a discussion on real-word data placement strategies for dealing with a complex world. Greg Forest has 30 years of experience in compliance, storage, application software, management, support, and implementation of technical solutions for information governance, data management and regulatory compliance. As Contoural’s CTO, he has developed methodologies to make information governance solution deployment predictable and cost effective, and has worked with Contoural clients to help them select, configure, test, implement, and train new solutions to reduce cost and risk while improving employee productivity. Records retention and data classification policies should not be created in a vacuum and should not only provide legal statements. Rather, when created effectively, they can be used to guide and drive efforts that work well with both your employees and your technology. - Steps your organization can take to make sure technology and people work together and against each other. As founder and CEO of Contoural, Mark Diamond is one of the industry thought leaders in proactive records & information management, litigation readiness and risk & compliance strategies. As a trusted advisor he and his company help bridge legal, compliance, security and business needs and policies with effective processes, technology and change management. Mark is a frequent industry speaker, presenting at numerous Legal and IT industry conferences as well as online venues. Additionally, Mark addresses more than one hundred internal corporate audiences each year. While you may not be able to avoid litigation, there is a tremendous amount you can do now to prepare for if and when litigation does strike. Join us for a thoughtful presentation on litigation readiness covering the policies, processes and technologies organizations can employ to reduce risk and costs of discovery. A little effort now can save a lot of pain and expense later. Tom is Vice President of Delivery Services at Contoural. With over 25 years of experience in compliance, litigation, privacy and information governance, Tom regularly works with corporations to develop information governance programs, including the creation and validation of records retention schedules. Tom served as Chair of ABA TECHSHOW 2008, and as 2011-2012 Chair of the ABA's Law Practice Division. Legal is about to start an information governance initiative. IT gets wind of it and says that this initiative would be redundant, as they have been working on a data governance project for the past six months. The data governance charter touches on some areas of information governance, but then again not really. Should there be two initiatives, or increase the scope of one of them? Join us for a lively discussion on the difference between Information Governance and Data Governance. Information Governance programs that address records management, privacy, litigation readiness and productivity hold the promise of delivering substantial value to the organization. Yet effectively executing these initiatives is both an art and a science. Join Matthew Bernstein from Deutsche Bank, Megan Hertzler from PG&E, and Andrea Meyer from the Foundation of CA Community Colleges for a lively discussion! Matthew Bernstein: Matthew is the head of Deutsche Bank’s Group Information & Records Management, which is responsible for the Bank’s eDiscovery, Records Management, and Archiving operations and strategies. Matthew joined the Chief Operating Office division in 2013 to lead efforts to improve the Bank’s ability to provide timely, complete, and accurate responses to requests for information, while retaining and disposing of records in compliance with legal, regulatory, and business requirements. Megan Hertzler: Megan is the Director, Enterprise Information Governance for PG&E, one of the largest natural gas and electric utilities in the United States. Megan leads the Enterprise Records and Information Management team, which is responsible for the effective management of PG&E records and information assets. Previously, Megan was the Director of Information Governance at Xcel Energy, an attorney in private practice, and an Assistant Attorney General providing legal counsel to the Minnesota Public Utilities Commission. Andrea Meyer: As the General Counsel and Corporate Secretary at the Foundation, Andrea Meyer oversees the contracts and legal team, facilitates contract management and legal review, manages outside legal counsel relationships, works collaboratively with the Chancellor’s Office legal affairs department to address mutual issues, and provides effective guidance on organizational strategies, programs, services, and their implementation as it relates to general risk management, compliance, and legal liability. Explore Contoural's programs to develop policies and best practices in IT, Data Management, and Cross-functional Policy Assessment & Implementation. Contoural is the largest independent provider of strategic Information Governance consulting services, including Records and Information Management, Litigation Readiness and Control of Privacy and Sensitive Information.